This month was our decorative aluminium shutters month. We highlighted how aluminium shutters can change the look of your home and how well it suits a minimalist home, then we looked at how decorative aluminium shutters can save you money and finally how to maintain your aluminium shutters to extend their life and get the most out of them. We protect our decorative aluminium shutters against the elements by applying a powder coating to the shutters that are also UV resistant. This means they can be installed indoors or outdoors and require much less maintenance than wooden shutters. Our decorative aluminium shutters have many aspects that set them apart from the other products on the market. 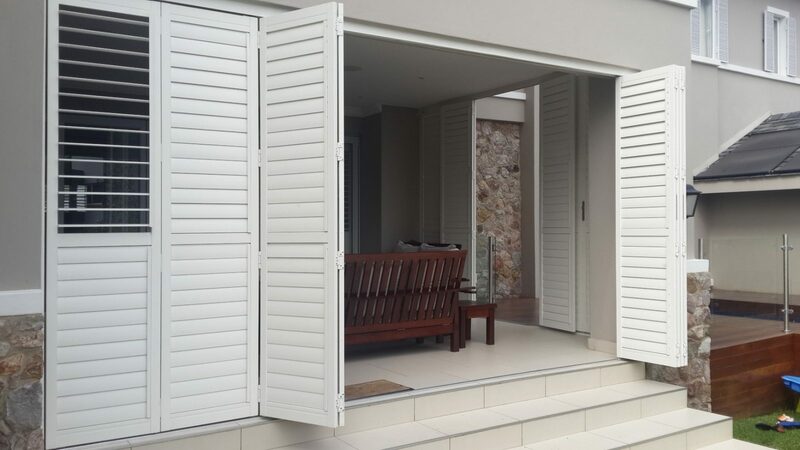 The first is that we manufacture our own aluminium shutters in our factories situated in Johannesburg which are distributed to our showrooms across the country so that you can save by purchasing directly from us. All the aluminium we use in our products are recycled, making our product green. One of the largest parts of our business is research and development so that we continuously bring you the latest technology on the market at the best prices. We have just launched our new decorative aluminium shutters this month. We have the only aluminium shutters on the market to include a ring pool and flush bolts, making them aesthetically pleasing. Our ring pools and flush bolts are specifically made for House of Supreme installations which make the fit unique to our product. We also make use of a slim run L-frame on all aluminium shutters frames, making the installation more solid, while remaining sleek and modern. The House of Supreme aluminium frame height is only 10mm allowing more light you’re your rooms, which again add to the sleek and stylish look we strive for. We use the same hinges in our decorative shutters as we do in our security shutters, which are superior quality and cannot be knocked out without major force. A silicon gasket is used to block out light between the shutter louvres on our bi-fold shutters when closed. We have a unique louvre design consisting of a ridge on the ends to block light out when they are closed. Also, unique to our decorative aluminium shutters design is an internally installed tilt rod, which is the same as our security shutters, giving a clear line of sight. Our installations also include a Vet frame – along with a slimline or a slimline L frame. This is again for the aesthetics. Applications of aluminium shutters can also be hinge, bi-fold and bypass if required making them very versatile. This is a real mouthful, but as you can see from the above, we have many aspects making our decorative aluminium shutters unique while saving you money. We pride ourselves in not only providing a superior product but a qualified team who provide outstanding advice and service. Why not contact us or give us a call on 011 462 7096 to see why for yourself? This entry was posted in Aluminium Shutters and tagged Aluminium shutters, Decorative Aluminium Shutters.